The College Sport Wellington Prize-giving and Sprint event, held at Victoria University, was an opportunity to fine tune some sprint skills for 3 of the local Wellington JWOCers before they head to Europe. Rebecca Gray was the course controller for the course set by Paul Teesdale-Spittle. 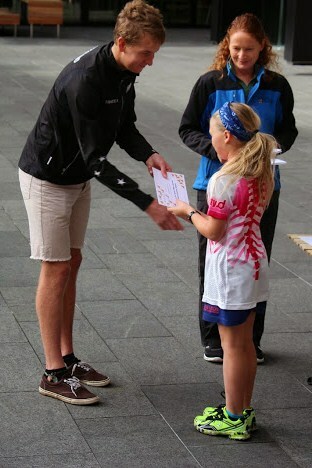 Prior to the Sprint Nick Hann was the ‘invited celebrity’, handing out certificates and medals to future Wellington JWOCers. After the presentations the Wellington students had the chance to compare their sprint skills with our NZ reps Nick & Shamus. The interesting question being whether local knowledge for Shamus (who attends Victoria University) would give him an advantage over Nick, who has recently updated the university map. Nick flew around the intricate, hilly 1.9km course in 14.21 minutes… leaving a 2 minute plus gap to the rest of the field. 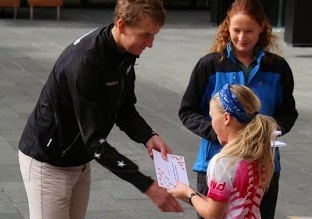 He looks fit and ready for the JWOC sprint in Samokov, Bulgaria in one months time.